Kitt's World: Roo hops up to the challenge. Roo is hopping up to the Peachy Keen Challenge. Of course he has a Peachy Keen Critter Face, which just makes him so stinking cute. 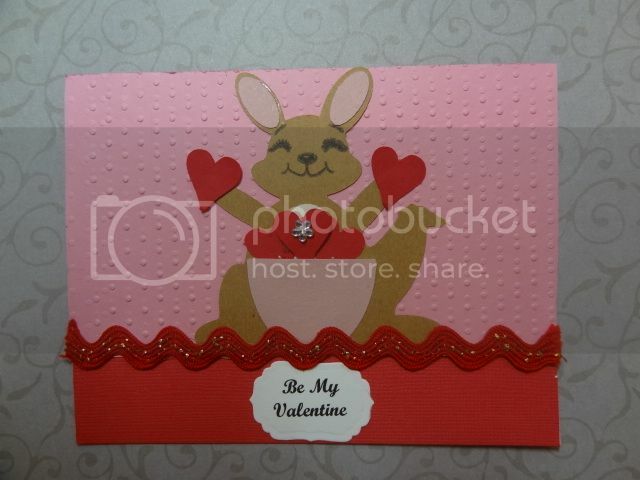 LOL I also entered Roo in the Valentine Challenge at More the favors challenge Wacy Weds. If you haven't followed Roo's creation a few posts back, I created him in Make The Cut. On this card, I used the cuddlebug swiss dots folder and of course his precious face from PK 754 Critter Faces set. The font I used was script bold for the sentiment and Spellbinders Label 4 nestabilities set. I used red with gold sparkles rik rak I bought at Walmart. Along with a small crystal flower I bought at Joann Fabrics. Wish us Luck! Roo will be hopping on to another card soon. Comments are appreciated. Thanks for stopping by. Roo is so darn cute! Adorable card! Thanks for joining us in this week's Peachy Keen Stamp Challenge! aaawwww...what a cute little guy! Love your sweet Kangaroo! Thanks for playing along with our challenge this week at Peachy Keen Stamps!